If you a Windows 10 user, you can add categories of Settings to the desktop context menu. This post describes a registry tweak that utilizes ms-settings: URI commands, which form the menu. In Windows 10, Microsoft has moved most of the Control Panel features into the new Settings software. One day, the classic Control Panel may be removed from the os. All versions of Windows 10 come with the built-in Settings app which has been added to the OS to replace Control Panel. You can change most of settings and options using Settings. Its user interface consists of a number of pages arranged by categories. Each page comes with toggle buttons, drop-down lists and check boxes to enable or disable certain features and change behavior of the OS. You can add those categories of Settings to the desktop context menu. Download the file Settings Menu and extract the contents to any folder you want. Double-click the file 'add settings desktop menu.reg' and click YES to apply the tweak. To remove the menu, double-click the file 'remove settings desktop menu.reg' which is included in the zip archive. You can choose where the Settings menu appears between Top, Middle and Bottom. The REG file sets the position to Bottom, but you can modify it by changing the line 'Position'='Bottom' in the text below. Copy the text above to Notepad, and save it as 'add settings desktop menu.reg'. Double-click on the reg file to add the menu at the required position. 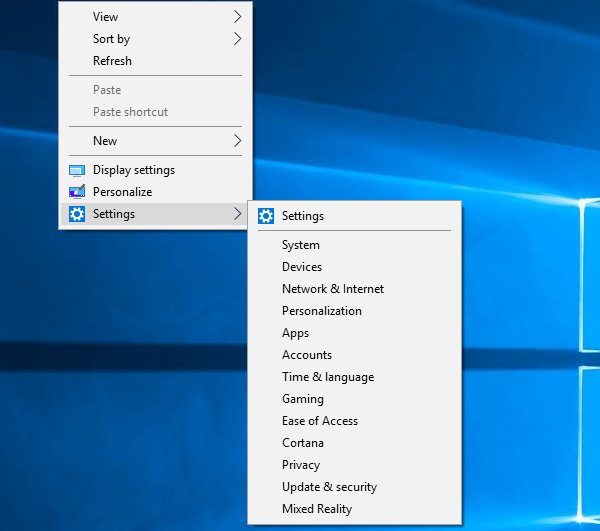 If you a Windows 10 user, you can add categories of Settings to the desktop context menu. Follow instructions in this post to create the Settings menu.